Let’s start with my pumpkin challah recipe, but make sure you braid it for authenticity purposes. Next, you need latkes. Skip the applesauce and use cranberry sauce instead. Better yet, top it with turkey like they did here. Did someone say Kugel? 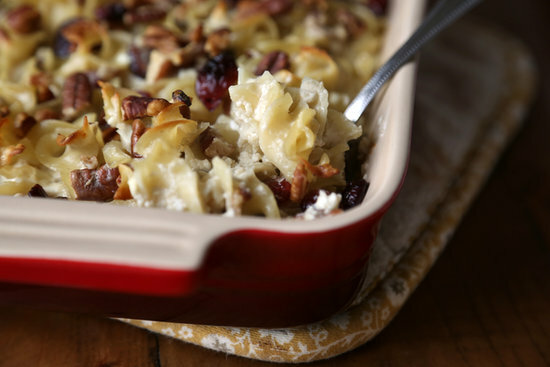 Anna over at POPSUGAR shares her Pecan-Cranberry Noodle Kugel. How about sweet potato muffins topped with brisket and cranberries? 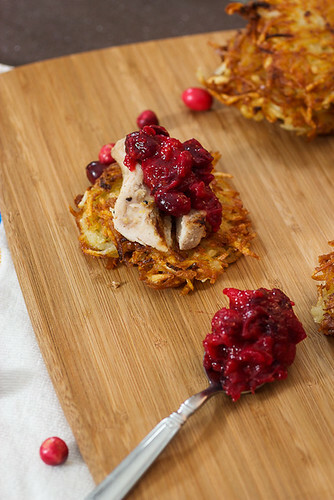 Buzzfeed came up with a pretty amazing Thanksgivukkah menu and DIY projects, so head over there for more ideas. Like this Maneschewitz-Brined Turkey. If you want to play something other than dreidels get your hands on the Magical Mitzvah Park boardgame. Happy Thanksgivukkah and chag sameach!